The story was inspired by Sarah who, of my three daughters, has always seemed to be the most curious about the world around her. When she was two I was a student teacher and Sarah spent her days in a wonderful Child Development Center. They had only a small yard and so took the children on many field trips to nearby parks. The director told me, "Sarah is always the last one to get on the bus, not because she doesn't come when called, but because she can't pass by anything without taking time to look at it." When she was a little older I remember once sending Sarah and her older sister Bethany out to move some rocks around a garden. When I went to see how it was going I found neither of them working. Bethany was muttering about the unfairness of being asked to do the chore and Sarah, having moved a rock, had discovered an ant nest and was absorbed in watching them. I had to admire her curiosity, even if I didn't like the fact the job wasn't getting done. Life seems always to go faster and faster and it is too easy to get caught up in getting from one place to another, one goal or task to another, without noticing and enjoying the process of getting there...and all the little interesting things along the way. Though I think it is a good idea to remind grown-ups to allow children time to be curious and explore, I probably wrote this story mostly for myself...to remind me to take time to notice and enjoy all the wonderful things around me everyday. The illustrations for this book were especially fun to do. Usually my books have pictures of whole scenes, often with several people, which means that everything has to be drawn pretty small. It is difficult to get in much detail when drawing a person only three or four inches high. Half of the pictures in What Joe Saw are like that, but the other half are close-ups of the things Joe sees. What fun! Instead of drawing big things small I got to draw small things big! I asked some kindergartners in a school I visited to help me by allowing me to take pictures of them in their classrooms and walking in lines and so on. Then I had a chance to accompany a preschool group on a trip to a duck pond and take more pictures. I looked at the photographs of these children to do the pictures of Joe and his classmates going to the park. For the animals I looked at photographs in books and magazines and took some pictures of my own. I probably looked pretty silly to passersby when I was on my hands and knees taking pictures of an anthill on the sidewalk in front of the library, or walking along the street taking close-ups of blossoming tree branches. The most important thing was the ducks. I had hoped to have ducks nesting in my own back yard that spring, but they didn't come. I made regular visits to the duck pond, and got some very nice pictures, but no babies. Unfortunately every nest the poor ducks started was disturbed ...often by thoughtless children who broke the eggs for fun. Finally, I happened to hear about a farm which had baby ducklings, a little older than I would have liked, and all yellow, but I went out to see them. They were quite shy of people and the big ducks tried hard to keep the little ones away from me. I scratched my arms and legs following them into the brush, and then had to stay very still until they would forget I was there. As soon as I'd move my camera, they'd scramble away. The pictures I took aren't great, but at least I'd gotten a good look at the ducklings...and had a very interesting morning! Joe is always last in line. The noisy kids call him slowpoke; even the teacher tells him to hurry up; but in the quiet away from the crowd, he sees things that others miss. The watercolor-and-colored-pencil illustrations emphasize the contrast in perspective as the class walks to the park with their lunch. First we see Joe with everybody else; then he's lagging behind, distracted, in the background. Turn the page, and we see close-up the small wonders that Joe sees--individual ants busy at work, a tortoise in the long grass, a bird with a worm. Joe sees the ducks that everyone else sees in the pond, but in a wonderful climax, he shows the class much more than that: the astonishing sight of two ducklings, newly hatched from their shells in the nest. Ages 3-6. Kirkus Reviews , August 15, 1994, Copyright ©1994, Kirkus Associates, LP. All rights reserved. American Bookseller Pick of the Lists! What a lovely story about taking time to see all the wonders of the world. Joe's class is taking a walk to the park to see the ducks. 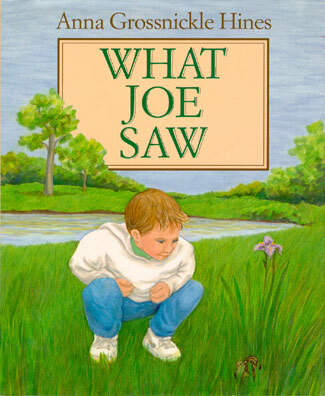 Joe may always be last, but it is because he is always seeing things no one else notices--a turtle, a frog, a bird, and ant, and many other wonders. A delightful story with beautiful pictures. Read this with a child and follow the reading with a walk with open eyes. I like everything about Anna Grossnickle Hiness What Joe Saw. The illustrations are lovely; the text, perfect; and the lesson, sublime. Slowpoke Joe takes his time and frequently sees what nobody else sees, because he looks. Children will get the point and follow Joe. They call him Pokey Joe. He's always bringing up the rear. But Joe sees things no one else sees. When the class goes to the park, the reader is treated to the special sights that he sees that the others miss. Joe sees a robin eating a worm, a chipmunk, a turtle, a frog and finally newly hatched ducks. Anna Grossnickle Hines helps us appreciate those children who are curious, observant and march to their own drumbeat. Although Joe is the last one in his class to get in line to go to the park, he is the first to see the small natural wonders that the others have missed. The realistic illustrations of animals are more effective than those of the children in this useful book. Horn Book, Copyright © 1995 The Horn Book, Inc. All rights reserved. What a great story -- for every teacher as well as child! Hines' illustrations of small things in the natural setting are wonderful and Joe sees them all because he's always looking! The teachers and other students in the class are intent upon some object at the end of their walk and urging Joe to hurry. However, in the end, they all see what Joe sees and, as a result, many of us may change our ways! Little Joe is always slow. "Slow poke, pokey Joe," chant his classmates as Joe pauses to observe ants marching along and squirrels scurrying up trees. When another child bends down to tie his shoelaces, he and Joe both notice fluffy ducklings breaking out of eggs. Then everyone saw what Joe saw. This pleasant tale teaches little ones an invaluable lesson in observance -- that if you're always in a hurry, you may miss out on life's little treasures. Joe is a slowpoke but he's richly rewarded in sights, sounds and experiences because he stops to smell the roses. Hines offers a gentle and much-needed reminder that a slow motor may not be a curse but is more likely a blessing. And lucky us, we can see what Joe saw over and over again in Anna Hines' lifelike critters worked against a background of the myriad greens of spring. A warm and inviting story, especially for sharing with the quiet observer. Oh, the things missed when all energy goes into scrambling to be first at the top of the heap. It is rare to find a modern children's book in which independent thought and action provide a child with his own reward. (Usually any "rewards" come as a result of a grown-up's approval or stem from a cooperative enterprise.) This simple picture book of a young boy who "marches to a different drummer" succeeds on all levels--it sustains children's interest, makes its point without preaching, and lets its message rise from real interaction between characters. Understated text and sensitive illustrations (I particularly loved the drawings of Joe's face while he was looking at things) make this book especially appealing to young children. Anyone who enjoys marching to the beat of a different drummer will identify with Pokey Joe, hero of Anna Grossnickle Hines' new picture book What Joe Saw. The hero of the tale discovers that taking independent action has its own rewards. While his more hurried classmates dash off for a visit to the local park Joe dawdles behind in order to savor the wonders of nature. Sights like a bluebird perched on a branch or ants marching up an anthill prove to be a powerful lure for the curious youngster who always slows down to enjoy the spectacle. "Come on, Pokey Joe!" tease his classmates. However, Joe will not be rushed and continues taking time to see what others in their haste overlook. Children of all ages will take delight in Joe's discoveries, vividly brought to life in rich watercolor and colored pencil. A gentler sort of story with lovely images and charming text is What Joe Saw. Joe is always poking along last, but that doesn't bother him: he sees nifty things, like anthills and chipmunks, that nobody else notices. In the end, Joe has others stopping and looking, too, and what a treat is in store for them.